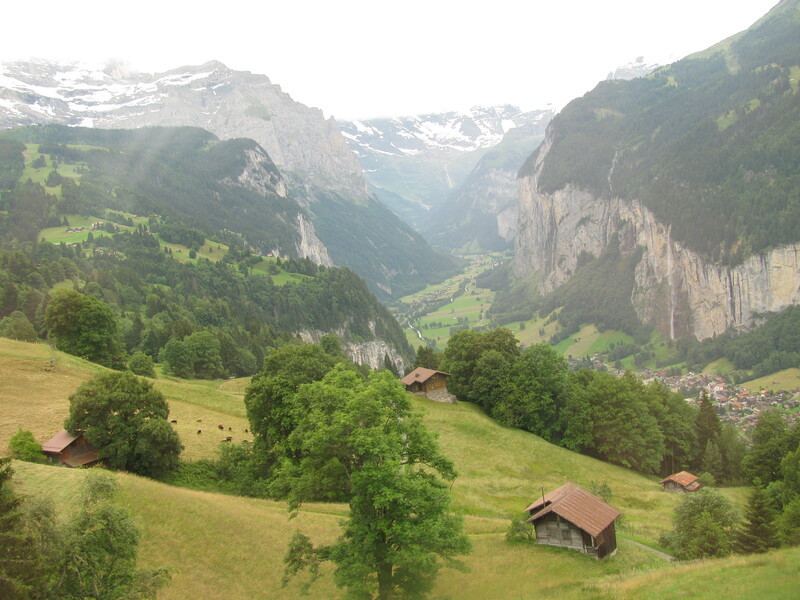 On the cogwheel train ride up from Lauterbrunnen valley to Wengen in Switzerland's Jungfrau region. This place is makes me feel good about myself, mostly because I’m running into people more abrupt than me. Saturday, Dave and I returned to Switzerland’s Interlaken region to see what was on the other side of the mountain range we had admired weeks ago and to see if we could make it to the “top of Europe,” that is “Jungfraujoch,” which stretches 3,454 m into the sky. I don’t know this for sure. I am only guessing. 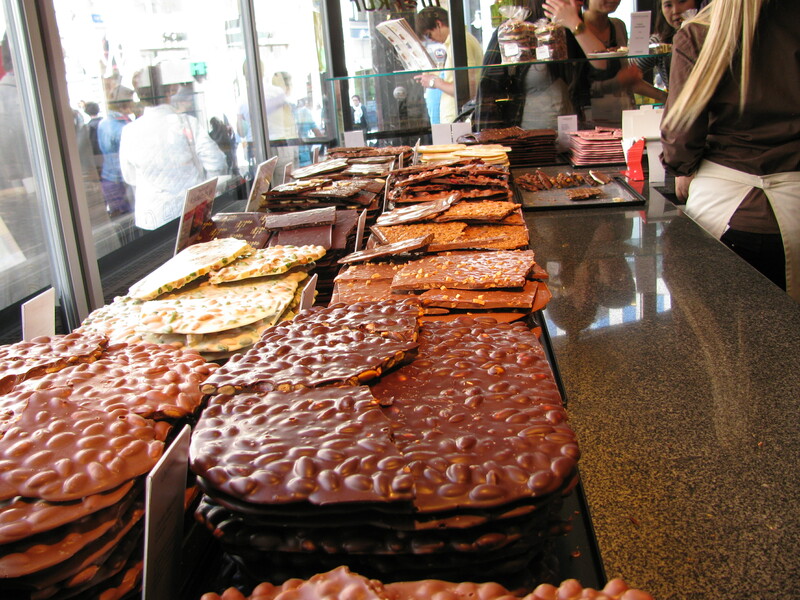 Another mystery is why the region is called Jungfrau, which translates into young woman, or someone told us “virgin.” Perhaps it was virgin territory at one time, but now it is a playground criss-crossed by tour buses, trails, trains, gondolas and the like. Nevertheless, it is massive enough to absorb these human tracks without losing it’s grandeur. Hildegard, hard at work. Time waits for no man, and Hildegard waits for no customer, although technically, she is a waitress, so you would think she'd wait around while we figured out our order. 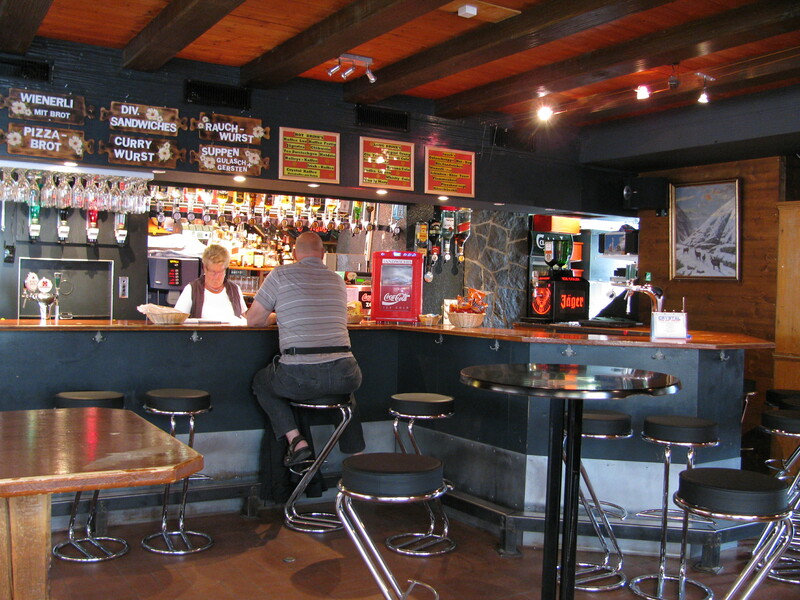 We got off the train in Wengen and stopped in at the Crystal Cafe Bar, a place that looked and felt eerily like Hideaway Tavern in Redditt, Ontario, which is run by a robust family of Icelandic extraction. Hideaway no longer functions as tavern, although the family is still there and they still run hunting and fishing excursions, as well as rent cabins. We half expected to see them when we stepped inside Crystal Cafe’s honey-beadboard wood interior with plain, sensible furnishings. I am not making up Hideaway Tavern, which is now known as Hideaway Outfitters. Click on Hideaway to check it out. A little abrupt, but not in a rude way. I suddenly realized I was staring at a person who had taken my level of abruptness and doubled it up. She was to me, as I am to most Canadians, that is, just a little sharp. It was refreshing. After all, I am in some oblique way related to these quasi-Germanic tribes. Obviously, the plain-spoken gene is dominant. Hildegard tried to escape then, but we hailed her back and managed to put in an order. Cheese cake in theory; quiche in fact. Lousy cheesecake. Good quiche. We watched her work other tables and she had the same manner, which roughly went along the lines of “what do you want?” and if the customers didn’t know what they wanted right away, she wasn’t about to coach them along. She would just leave while they sorted out their problems on their own. She had enough work to do without babysitting customers. Dave ordered a grilled ham sandwich, which was good, and I ordered cheesecake. Cheesecake is not exactly recommended for lunch in accordance with the Canada Food Guide, but it is loaded with protein and I am ever curious as to the form cheesecake takes in other countries. As a side-note, about 28 years ago Dave and I sublet our townhouse to a Swiss family. The wife invited me over for cheesecake one afternoon, and what with her being Swiss, and this being a cheese-laced dessert, I expected great things. What a disappointment. It was the worse cheesecake I had ever had. I think she was from the German side of Switzerland and so did not brook any nonsense that would dilute the cake’s cheesy character, such as by adding whipping cream, eggs or sugar. We were surprised by the dimensions of the ketchup packet. 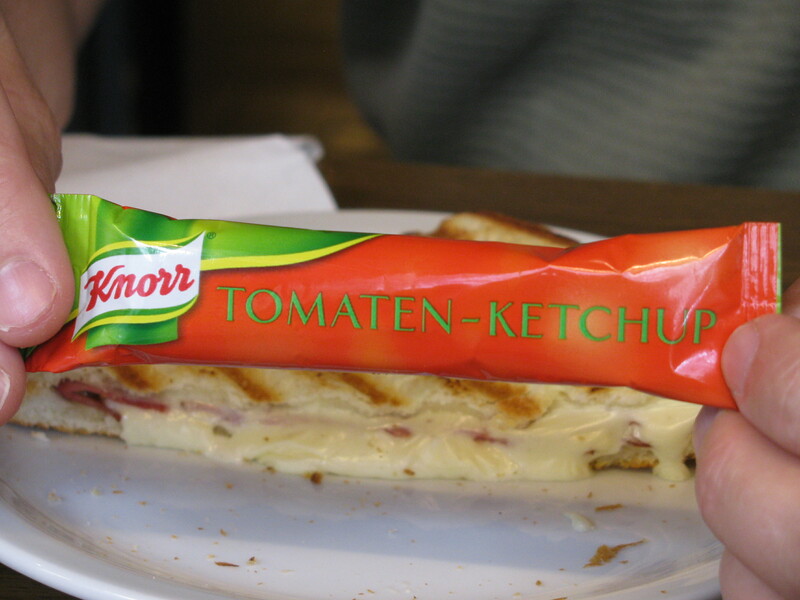 We think it says, "If you don't like your lunch, just spray it with this." But no mind. After a 28-year interval, I was ready to try another Swiss cheesecake. Hildegard returned with two small cheesecakes with scorched black tops. This made me feel at home and I silently blessed Hildegard for correctly reading me as a person familiar with burnt offerings. As cheesecakes go, these were infinitely worse than my last Swiss cheesecake. 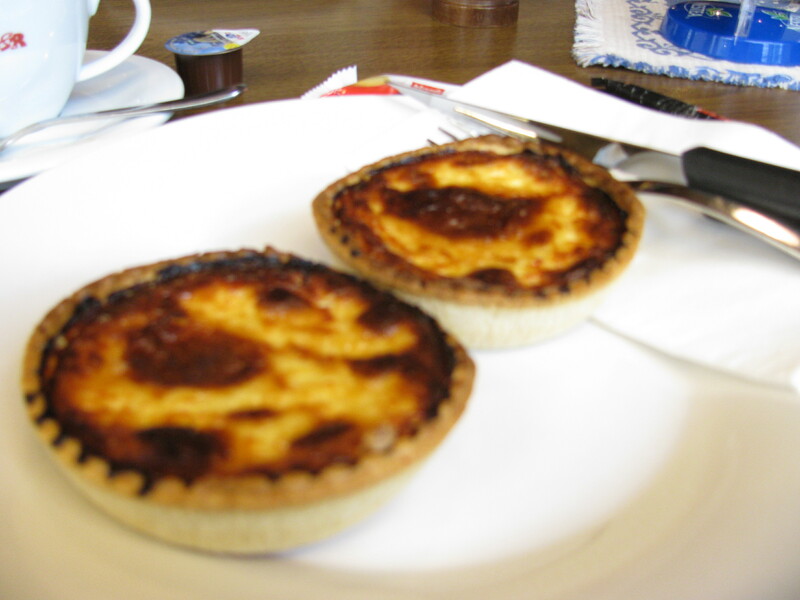 In fact, they were not cheesecake at all, but quiche. Very cheesy quiche. And, as such, were excellent. It was exactly the right thing before trying a mountain hike. Tomorrow: Heading up the mountain. 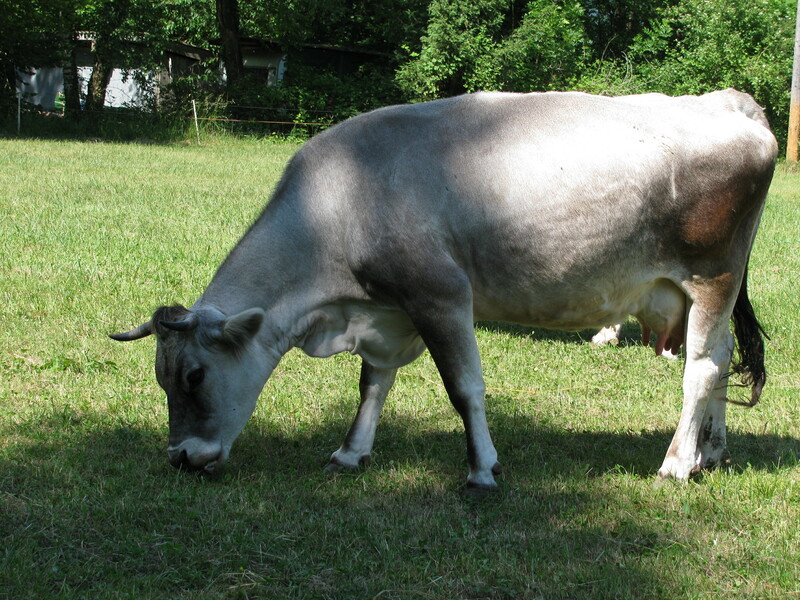 A Swiss cow, WITHOUT a cowbell. What is the land of cheese coming to? I did not make up the nickname “cowbell country” for Switzerland’s Appenzell region. The Swiss did that all by themselves. How the cowbells earned higher billing than the cows themselves is beyond me, but we aim to find out. In the meantime, we wonder what kind of conversations dairy farmers have out there. Instead of discussing how many heads of cattle they oversee, maybe they discuss the pitch and tone of the cowbells. “Good chiming on the up-pasture trip yesterday,” Franz says. “Yah, yah, it vazt gutt!,” Johann replies. My goal will be to see the cow museum. Woo hoo! Dave’s goal will be to get me to ride the Kronberg bobsled ride. Click here to see it. Skip to the 20-second mark to get straight to the ride. Skip to the 1:20 mark to see how close the “bobsleds” get to each other at the bottom of the ride. Dave says, “What could go wrong?” and I have to admit it looks not-so-bad, except that is the same thing he said just before I slid down an enclosed waterslide tunnel at Whitewater in Atlanta, minutes before I got lodged in said tunnel, which eventually spit me out in a tangled glob of humanity. I will only tell you what that ride was like if someone asks me. It’s better not to ask. In the meantime, this blog will likely pass the 3,000 mark some time today. As one editor told me, “It’s the photos, dummy. Nobody cares what you write. They care about the pictures.” Editors. You gotta love’em.